So at the end of Pandemonium, Lena goes back to New York to rescue Julian, who she developed feelings for during their capture and escape. She had no idea that Raven and Tack made it a set up so to ruin the DFA's poster boy. Once rescued, they rejoin the group, and surprise, surprise Alex is alive and has escaped the Crypts in Portland. 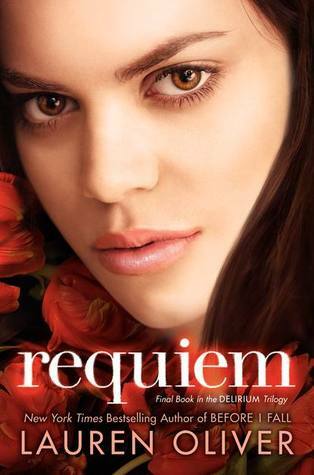 In Requiem the book bounce back and forth between Lena and Hana's lives. Lena is dealing with the reappearance of Alex, and the change that has happened to him while they were apart. Alex is aloof and avoiding her. When she confronts him, he tells her that he doesn't love her, and that he never loved her. This, of course, sends he rushing into Julian's arms. There is definitely a strained relationship between Lena, Julian and Alex which eventually leads to a Julian and Alex fight and Alex leaving the rest of the group. Hana is now cured and preparing for her marriage to Fred Hargrove, the new Mayor of Portland. She thought the cure was suppose to make everything easier, but she is still having dreams. She still feels guilty for turning Lena and Alex in, and the guilt press down more on her when she learns has happened to Lena's family as a result. Plus he soon-to-husband is not the quite the golden boy he appears to be. The resistance is growing stronger, and the Cured are cracking down more. Regulators are in the Wilds, and bombings in the civilization. Requiem is written in a way that you know that is leading up to the eventual confrontation between Lena and Hana, so there was no surprise when that happened. Honestly the Julian and Lena relationship felt so forced, and spent time debating whether Ms. Oliver did that on purpose to heighten the tension between Julian, Lena, and Alex, or that is just the way it happened. Plus Hana was a rather bland character in this book. She really fades into the background when she appears with any other character. When she sees Grace, Lena's cousin, it is Grace that steals the scene. It is Grace that I am drawn to as a character, and I almost forget that Hana is even there. I did like that Lena and her mother finally got reconnected. I know she made a brief appearance in Pandemonium, but here we finally saw them developing a relationship. Lena learning why her mother did the things she did, and her mother getting to know her the daughter she missed see grow up. The ending was so bleh for me. It left me with questions still, and so much unresolved. Like what happens to the world, does the resistance succeed in the end or does the establishment beat them back down? What happens to Hana, Lena, Alex, and Julian? As I finished the last page, I find myself muttering, "Is that it?" I feel so unfulfilled be the ending to the book and to the trilogy.